Will the next MacBook Pro get Quad-Core Sandy Bridge chips? Two interesting reports came out yesterday, the first from DigiTimes who, citing component manufacturers, claims “that Apple plans to launch at least four upgraded MacBook Pros” in the first half of 2011. These new MacBook Pro’s are also said to feature a slight modification to the chassis, and they will reportedly include the new Mac OS X 10.7 Lion operating system. Now this rumor sounds pretty realistic, of course Apple is going to release new MacBook Pro’s next year right? My guess is the chassis change will be a general slimming of the case to accommodate for a lighter and more MacBook Air type of enclosure in the Pro lineup. Of course I could be wrong but based on Steve Jobs words, it sounds like the natural progression of the portable line. So that is interesting right? Well I think this next report might be more interesting, and also may end up relating to the MacBook Pro. CNET is reporting that Intels new Sandy Bridge Quad-Core chips will be making their way into 15″ and 17″ laptops as early as January 2011 at the Consumer Electronic Show expo. See what could be going on here? Judging by the current MacBook Pro 15″ and 17″ models, I think there is a good chance that we’ll see these new Intel Sandy Bridge chips in the next revision of the MacBook Pro lineup. Also interesting to note is that dual-core versions of the Sandy Bridge CPU’s will be available a few months after the quad-core release, so maybe we’ll see the MacBook Pro 13″ finally abandon the Core 2 Duo and make a jump to the new Intel Sandy Bridge CPU as well. Nvidia’s graphics chips are expected to be used in a number of Sandy Bridge laptops. Most of those systems will use Nvidia’s Optimus technology, which switches between Intel’s integrated graphics and Nvidia’s processor, based on power-saving and performance requirements, respectively. This would be similar to how MacBook Pro Core i5 and Core i7 models currently operate, switching between the onboard Intel and NVidia GPU’s when needed. Until there’s anything concrete, treat all of this as rumor and speculation, but it looks like 2011 could be an exciting year for the MacBook Pro line. 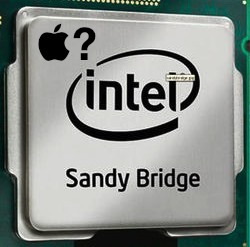 Sandy Bridge MacBook Air & Mac OS X Lion Release on Wednesday, July 20? I really hope they all get flash drives too. Oh and move the MBA and MBP 13″ away from C2D chips, finally. Yes, with Apple’s OS X Lion on its way out next year it may be a great year for the humble Macintosh next year. It’s actually a cool and helpful piece of information. I am happy that you just shared this helpful information with us. Please keep us up to date like this. Thanks for sharing.